ASIS Certifications | ASIS Victoria Chapter - The leading organisation for security professionals. Certification plays an important role in the security industry by identifying high professional standards. As an indicator of qualifications, certification is documented evidence of competency and experience. It is an objective means of distinguishing highly skilled security practitioners from those who claim to be. In today's security environment, professional certification is required for those high-level security positions that are most sought after. Where a person has not previously held an ASIS International certification that is not renewed within the ASIS International Rules, it is expired. A person with an expired certification cannot advertise any ASIS International certification i.e. cannot use any relevant post-nominal (CPP, PSP or PCI) that is expired. Advertising an expired certification is unethical, false and misleading. Such activity can be subject to disciplinary action, prosecution and litigation. Where a person has never held a certification and purports to hold any ASIS International certification, the Chapter will vigorously pursue (with public exposure) prosecution for fraud including false and misleading conduct under Australian consumer law. ASIS Victoria Chapter members provide study opportunities and support to assist with certification. Contact us for more information. Members of the ASIS Victoria Australia Chapter can provide you with advice about certification in any of the above designations. 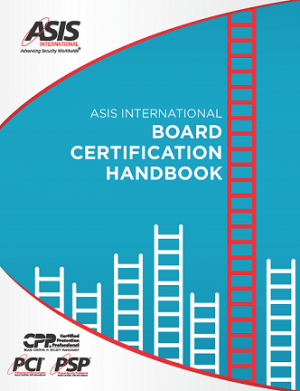 This Handbook covers all the information on ASIS’ three certification programs. This Guide covers all the information on ASIS’ three certification programs. 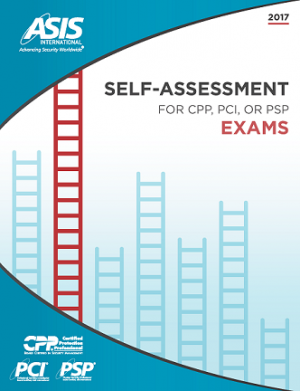 The ASIS International “Professional Certification Board” (PCB) has updated the CPP study domains to ensure the exam content remains current and accurately reflects job-related activities, competency, and professional standards. ASIS International has strict rules on the usage of certification marks.